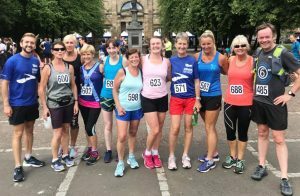 Boosted by the support of local running group The Runbetweeners, Jog Scotland, and a number of youngsters taking advantage of the school holidays, the July version of the 3k in the Green set a new record for those participating in the Best Wee Race in Scotland. An amazing 162 runners completed the course, 50 upfrom the corresponding fixture twelve months ago, coincidentally this included 50 first timers. Within the ranks 50 females, 12 juniors and six over 65s, including the oldest participant on the day, 75-year-old Bill Parker. The setting was a bit strange with high fencing cordoning off much of Glasgow Green which also resulted in the route being more congested than usual but even with the huge numbers the race experienced no issues whatsoever, thanks not only to Al Murray and his small team of volunteers but also to the great support and attitude of all 162 competitors. There was strong competition all the way through the race, not least of all up front, where after shooting off at a fast pace Jonathan Roebuck thought that he had established a comfortable lead only for Kieran Cooper to catch him 200m before the turn. Kieran was running the race of his life but he couldn’t shake off Jonathan and he faded in the latter stage allowing Edinburgh based Jonathan to reclaim the lead and earn victory at the third time of asking, with a time of 9:21. Kieran had to settle for the runner-up spot with 9:30 and a PB of some 20 seconds. 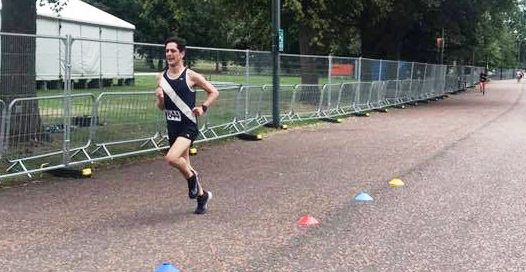 Bellahouston Road Runner, Ciaran Dougherty placed third with a time of 9:40, just one second out of his PB. There was a record turnout in the women’s race, with Victoria Park’s Anna Tait being the first of fifty female runners crossing the line. It was two out of two for the Orcadian who also won the women’s race in May. The 21-year-old earned Gold with a time of 9:49 and also recorded the highest female wava, with an age grade of 85.13%. 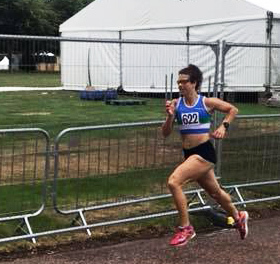 Making her debut, Edinburgh AC’s Rebecca Burns placed second with a time of 9:59, two seconds faster than her 3000m performance at the recent UK Women’s League Premier Division race held in Grangemouth on the 9th July. Another of the fifty debutantes, Strathclyde University Harrier, Maddy Watson (U23) earned third with a time of 11:28. Kilmarnock Harrier Ellie Anderson was the first female junior, crossing the line in a time of 12:26. Thanks to the Runbetweeners for the photos.